Flaky, sweet, golden pastry with apple filling! Fruit filled flaky pastry! 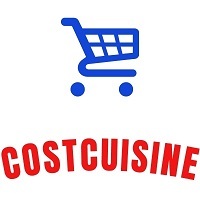 If you would like to to read more reviews on Costco food products such as this one follow me on Instagram or Facebook and also check out my blog Costcuisine where I review tons of Costco food products each week! Last week I reviewed the Costco Prairie Creek Kitchen Bison Smoked Sausage, the Costco Kirkland Signature Cocoa Dusted Almonds Sweet Chocolate Almonds and the Costco Kirkland Signature Italian Style Beef Meatballs. 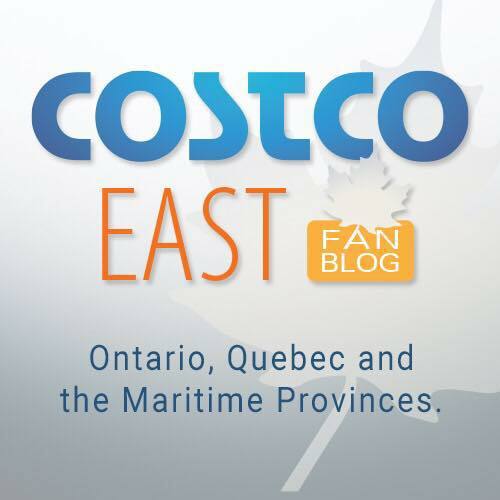 I also did a post on my Top Ten Favorite Recent Costco Food Items! 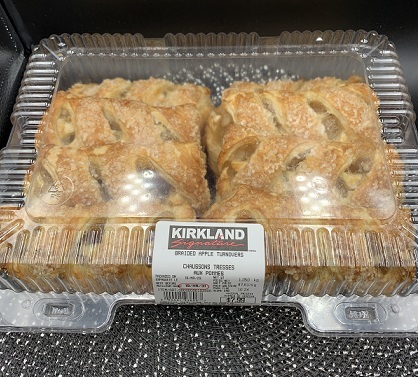 On my most recent trip to Costco, I decided to pick up the Braided Apple Turnovers. I’ve tried lots of different pastries from various bakeries and grocery stores over the years, but I’d never tried the turnovers from Costco. They definitely looked appetizing, so it seemed like a good item to review! If you don’t know already, a turnover is a pastry that’s made by placing a filling on pastry dough and folding the dough to seal it inside. 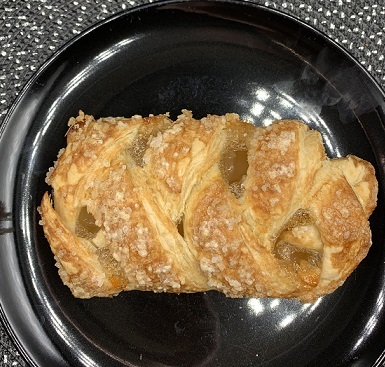 The Costco Braided Apple Turnovers are made with a sweet, golden, flaky pastry on the outside with an apple filling (basically the same as what you’d find in an apple pie) on the inside. The pastry is sprinkled with large granulated sugar on the outside, which adds to the sweetness and also gives the pastry a bit of a crunchy texture. The pastry dough on the top of the turnover is slightly crisp, baked to a golden color and flakes apart easily when you bite into the pastry. The pastry dough on the bottom is a lot more dense and moist. If you like apple pie, you’ll like the filling; it’s simple and sweet. I wish the filling had a little bit of cinnamon or some other spice to give it a boost in flavor, but overall it’s quite tasty. I actually would have liked a bit more of the filling in the turnovers; the pastry/filling ratio seemed a tad too pastry-heavy. 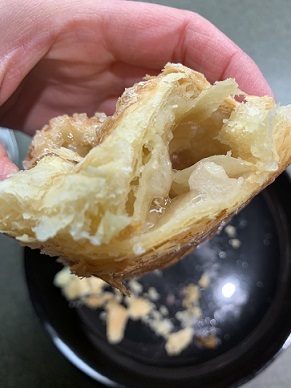 One thing my husband and I noticed while we were eating our turnovers was that parts of the filling seemed almost gelatinous, like an apple filling slime. This more-gelled filling didn’t taste off at all, but it looked a bit strange and also left the plate extremely sticky where it had touched (and was hard to wash off after). Overall, the turnovers were very fresh and delicious. We heated them in the microwave for a few seconds and added some vanilla ice cream on top and it made for a great dessert! The regular price for the Braided Apple Turnovers is $7.99 Canadian. There are eight turnovers in the container, so each turnover costs about a dollar. The turnovers are definitely the largest turnovers I’ve come across in a grocery store, so in my opinion the price is reasonable. They’re certainly far cheaper than any baked item you’d find at your local coffee shop! I can’t imagine the time and effort that would go into baking turnovers from scratch, so buying them is obviously much more convenient. I would also say they’re a convenient alternative to apple pie since you don’t have to worry about slicing and serving a pie, and turnovers are easier to transport to work or school. 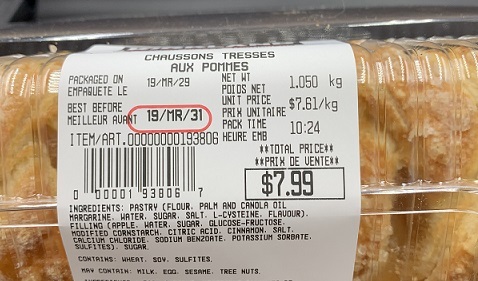 The turnovers come in a resealable plastic container, but the best before date is only two days after the packaging date, so you can’t really store them this way for too long. As the turnovers age, they get slightly softer and soggier, so if you can’t enjoy them within a day or two, freezing them is probably a better way to go. They taste just fine after defrosting. As you’d expect, the Costco Braided Apple Turnovers are loaded with sugar and fat. One turnover is 470 calories, 22 grams of fat, 340 mg of sodium, 44 grams of sugar and four grams of protein. Even though they’re not very healthy, I still can’t resist eating them for breakfast once in a while! I guess one way to think positively about the nutritional value of the turnovers is that they have apples in them? You could cut the turnover in half to reduce the amount of calories as well. I wouldn’t hesitate to buy these turnovers again. They’re delicious and work well as a breakfast treat or as a dessert. I think I would like them even more if they came in cherry, so hopefully that happens someday! Seriously, try them warmed with vanilla ice cream. It’s just as good as a slice of apple pie. What’s your favorite Costco bakery item? Have you had the Costco Braided Apple Turnovers? What did you think? I’ve been buying these turnovers for years for my husband’s lunches. They are yummy but very filling after eating them a few times. I’ve switched to buying the frozen cases (ask for them at the bakery). The cost works out to be $.50 each, a savings of 50% when baking them at home, provided you have freezer space. 400 degree oven for 45 minutes (don’t forget the parchment paper!) I, too, hope they’d have a cherry flavour soon. How many come in a frozen case? Caroline, how many come in the frozen cases? Thanks Caroline! I think I’ll be picking up a case, I never knew Costco did that. Apparently they do it with the cookies too! I agree great tasting but not enough apple filling, I won’t mind paying more for more apple filling. Really flakey and messy to eat. I really like these turnovers, but I agree with everyone else they need more filling. More filling and they would be perfection! Are they available in tbe Okotoks store? They should be Janet, I see them at pretty much every Costco I go to.